The new school year is on the horizon, and you want to get ahead of the game. Beginning your back to school kitchen prep early will reduce stress and make you feel prepared. We want to help you take the guesswork out of back to school organization, so let’s take a look at some steps you can take to tackle the school year with confidence. The heart of the home resides in the kitchen. Let’s look at some back to school kitchen prep ideas for a clean and organized space. For detailed instructions on cleaning your oven with this items click here. As we use our dishwasher over time, small amounts of food particles, grease, and grime get all over the inside workings of your appliance. Not only will this offer an unpleasant odor, but eventually it may prevent your dishwasher from cleaning adequately. Follow these steps to clean your dishwasher and ensure it operates efficiently. Step #1: Clean the drain – Remove the bottom rack and make sure the drain is free from debris. This is the most common cause for dishwashers not working properly. Step #2: Vinegar Wash – Start with an empty dishwasher. Fill a heavy cup (i.e. coffee mug) with white vinegar and place carefully in the top rack. Run the dishwasher on the hottest water setting for a full cycle. This will remove grease and grime from the inside of the appliance. Step #3: Baking Soda Wash – Start with an empty dishwasher. Sprinkle a generous amount of baking soda onto the bottom of the dishwasher. Run the dishwasher on the hottest water setting for a short cycle. This should eliminate any residual odor from the dishwasher. Cleaning out your refrigerator doesn’t have to be an overwhelming chore. Here are some options for making your cleaning project simple. Option #1: Spray Clean – Remove food from one shelf at a time. Spray shelves with vinegar spray (or your favorite natural cleaner) right where they are, then wipe/scrub clean. Next, remove drawers to scrub in the sink, rinse, and replace in refrigerator. Option #2: Tub Soak – Remove all food from refrigerator. Remove all shelves and drawers and place into a bathtub of hot soapy water. While shelves and drawers are soaking, wipe down the remaining interior of the refrigerator. Then, go back to scrub and rinse off shelves and drawers, finally replacing them into the fridge. 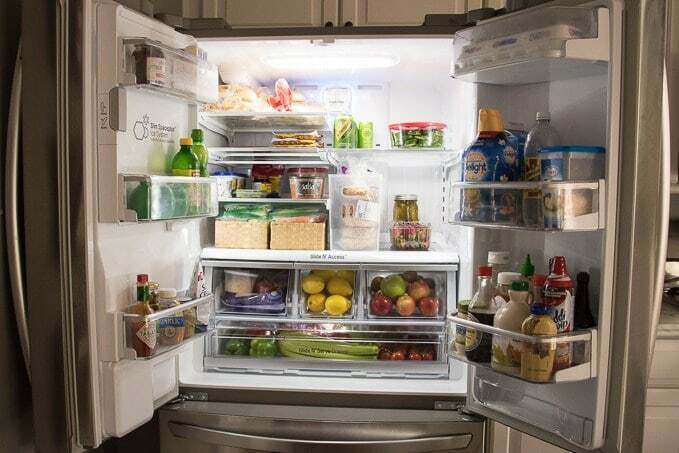 Once the refrigerator is clean, you’re ready to organize! Back to School organization includes thinking about how you’re going to feed the family. With a couple of creative refrigerator organization tips in place, you’ll be more organized than ever. Tip #2: Create Zones – Designate a shelf or space in the refrigerator for meal zones. A Lunch Zone is incredibly useful, as it contains everything needed to make and pack lunches throughout the week. Place the appropriate bins in the lunch zone, and children and adults will know exactly where to go when it’s time to get lunches ready. A Breakfast Zone can include all your favorite breakfast items, and can be located low enough inside the refrigerator for little hands to access safely. A Snack Zone keeps snacks handy for everyone. When it come to back to school kitchen prep, the best ideas begin with good intentions. Let’s turn those intentions into an action plan! Take these action steps to save valuable time during the week. Action #1: Have Ice Packs Ready to Go – Place ice packs inside a freezer bin so they’re ready to grab in the mornings. You can even put juice boxes in the ice pack bin! During the hot months, kids can grab an ice pack and a frozen juice box for a double dose of cold in their lunch box. Toasting sandwich break keeps it from getting soggy. Salad-in-a-Jar makes salad stay fresh- use large mason jars for adults, small mason jars for kiddos that like their greens! Wash/prep/cut fruits and veggies so they are ready to eat. For more healthy lunch ideas click here. Get your appliances serviced now before the school year begins! 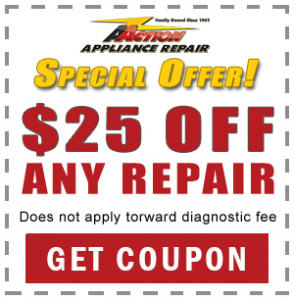 The professionals at Action Appliance Repair will make sure all your appliances are operating at peak performance so you can focus on life at hand. Below are a few more resources on Back to School kitchen prep and organization.